IAQ and Grilling: Do They Collide? Everyone's getting into grilling these days. And why not? It's an easy way to cook for company, and you eliminate cooking odors and mess from the indoors. But grilling, as with anything using combustible fuels, should be conducted with care. We're not just talking about preventing fires and explosions, but also eliminating negative effects on IAQ, or indoor air quality. What Negative Effects on IAQ? 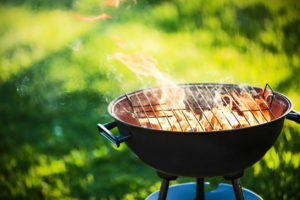 You may not be aware, but grilling too close to your home can have a negative impact on your indoor air quality -- and the safety of your home's occupants. Grilling produces carbon monoxide as an off gas, and that CO can enter your home, sickening its occupants and even causing death. CO is an odorless, tasteless, invisible gas. It can cause headaches, fatigue, nausea, disorientation and unconsciousness. It can also kill you in high enough concentrations. CO is given off by a number of sources including gas appliances, woodburning, kerosene heaters, charcoal and propane grills, idling cars in garages and boat engines. If any of these sources are inside your home or garage, or too near your home, the CO may waft inside and sicken or kill people and pets. If you have any fuel-burning appliances in or near your home, protect your household with CO monitors. There are several types of CO monitors. Detectors that use household current generally employ a solid-state sensor that periodically purges and resamples for CO. Battery-powered monitors generally use a passive sensor, which reacts to prolonged exposure to CO. Regardless of which type you choose, be sure it is verified by Underwriters Laboratory in their CO detectors standard for UL 2034. Monitors with digital readouts are preferred. Monitors should be placed on each level of a house, or located in any area where there is a gas-burning appliance. Mount them at least 5 feet from the ground. Replace any CO detectors more than five years old. For more on gas or charcoal grilling and effects on IAQ, as well as HVAC maintenance, repairs and installations, contact Hartman Brothers, servicing northeast Indiana.